Hayden Porter died last week and his parents think bullying was one of the factors in his suicide. 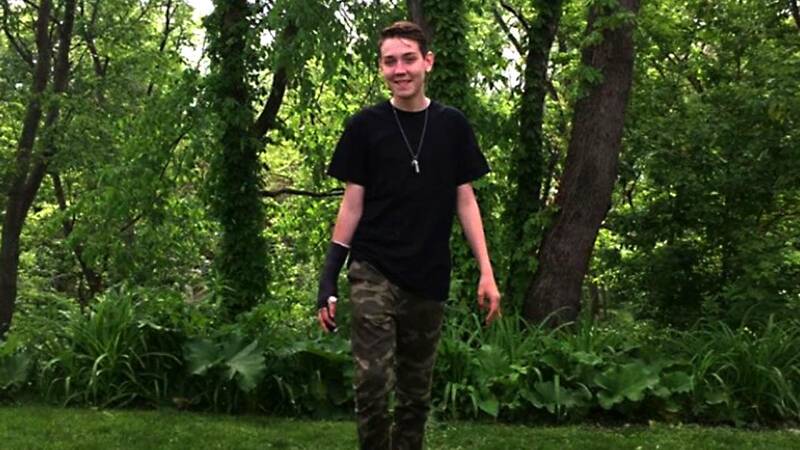 (CNN) - Late last week, Hayden Porter, a 15-year-old freshman at a high school in Ohio, took his life. He was the sixth current or former teenage student from the school district to kill themselves within the past six months. Three of the suicides occurred in a span of 11 days in January. Police say the suicides don't look like they are linked, and the methods the children used were varied. Chief Michael Pomesky said over the past five days, his officers have responded to more than two dozen calls concerning potential suicides or requests for police to check on someone. He said the community of Perry Township, about an hour's drive south of Cleveland, is in crisis. "We pretty much went from no suicides to this," he said. Porter's mother, Ashley Jones, told CNN affiliate WJW she thinks her son was bullied. Her son, worried about what four boys might do to him, had to be picked up from school one day, she told the Cleveland station. But she had no idea her son would kill himself. "Please tell somebody because he didn't tell us. He didn't speak. Maybe he was scared, I don't know, but if something is going on, don't be afraid to speak up," Jones told WJW. Hayden's father, Shaun Porter, told CNN affiliate WEWS that Hayden had told him he was fine. "Got off the bus, we talked for 30 to 45 minutes. I never thought he would've done that that day," Shaun Porter said. The teens who have taken their own lives were 14 to 18 years old, Pomesky said. He said about bullying: "We're aware that that is a factor in some suicides, but we have not identified that, as an agency, in these cases." The chief implored parents to be involved. "The most important part of this is that parents need to have conversations with their kids," he said. Almost one in five teenagers between 15 and 19 has considered suicide, and nearly 10% have attempted it, according to the US Centers for Disease Control and Prevention. Among Americans between 10 and 24, suicide was the second-leading cause of death in 2015. Some proven strategies for preventing suicide among youth include "strengthening access to and delivery of suicide care, creating protective environments, promoting youth connectedness, teaching coping and problem-solving skills, and identifying and supporting at-risk youth," Melissa C. Mercado, a behavioral scientist in the CDC's division of violence prevention, said in November. "Suicide is a public health problem that has far-reaching consequences," she said. "Suicide impacts friends, family members, co-workers, communities and society." Officials at a Friday news conference in Ohio said the 1,700 students at the high school, which is in Massillon, will be provided with an increasing number of resources. "Know that our district will continue to work, we will not give up," Perry Local Schools Superintendent Scott Beatty said. The six students included four high schoolers, a middle schooler and a Perry High graduate who lived in another town. The school district, in a statement, requested members of the community help its students. "We ask parents, residents, local organizations and everyone in the community to wrap around these young people to provide supports for those who are grieving and support for those that are dealing with difficult situations." The district website includes a link to a help flyer that says: "You are not alone. There is help available."